Rewicked Candle Co. makes beautiful candles in reclaimed (read:empty) bourbon bottles. What’s better than a handmade bourbon scented candle with a wooden wick in a Maker’s Mark bottle? Drunkwood specializes in art and functional pieces made from both bourbon barrels and reclaimed barn wood. His Kentucky shaped bourbon barrel stave wall hangings are featured in restaurants around Louisville, such as Feast in Nulu. If you want a special piece order soon- this one-man operation is running out of time for special Holiday orders! 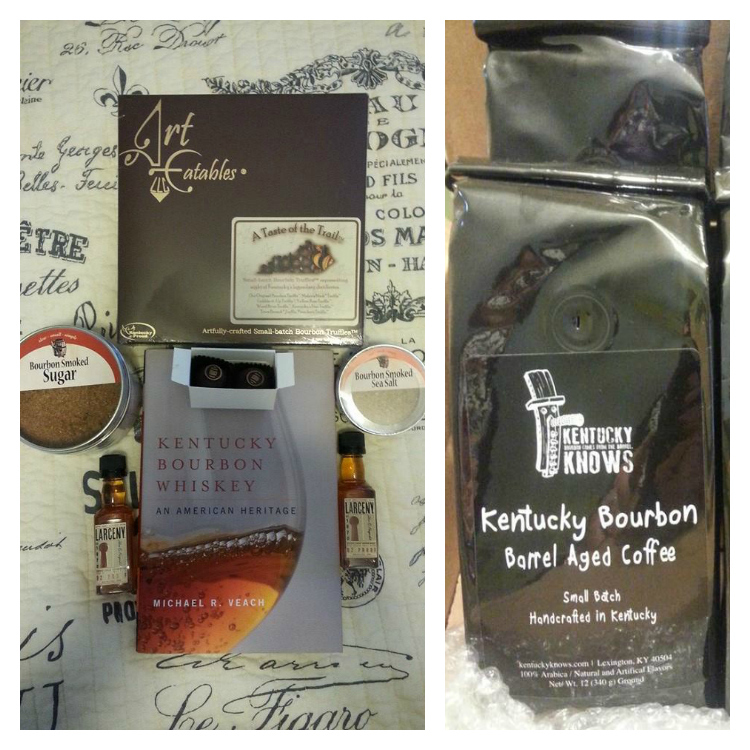 Kentucky Knows makes cutting boards from barrel heads as well as my absolute favorite bourbon barrel aged coffee. Both are available at Kentucky Liquor Barn locations. Single Barrel Soaps make handcrafted bath products stamped with bourbon barrels in a number of scents and styles, including bourbon and tobacco and bourbon ale. Bourbon Barrel Foods is the perfect place to shop for the foodie or mixologist in your life. This company began as the only soy sauce microbrewery in North America, specializing in bourbon barrel aged soy sauce. Now they make everything barrel aged or barrel smoked you can imagine, from sugar and salt to spices and marinades. Art Eatables is the only Stave and Thief certified chocolatier in the world. They specialize in small batch handmade bourbon truffles, but they also carry a wide variety of nut-free chocolates and confections. Bourbon Outfitters is a great place to pick up a “Bourbon for President” t-shirt, a mint julep pitcher, or a mini barrel for aging cocktails. Pappy and Co. is run by the Van Winkle family, making it the closest most people will come to a bottle of Pappy Van Winkle this Christmas season. They sell official Pappy merchandise, from bar sets to belt buckles. If the bourbon lover on your list doesn’t have Kentucky Bourbon Whiskey: An American Heritage by Michael R. Veach or Bourbon Curious by Fred Minnick, it’s time to pick those up. You can find more suggested reading here. Whiskey By The Glass sells a wide variety of apparel and bar ware, including bourbon barrel toothpicks and official Whisky Chicks t-shirts. Experiential gifts are also great. Tickets for The Bourbon Classic can be purchased here. There are also a number of Legendary Craftsmen Dinners being held at Buffalo Trace in January. Mint Julep Tours also offers many exclusive experiences. Thanks so much for these links. I got Bourbon loving friends gifts!